Add keywords in the description of your group to increase your search rankings on LinkedIn’s search section. Add keywords in the title of the group to be found on Google. Add your company website or blog to the group to drive traffic to your site. Add your blog RSS feed to the group so every new article is automatically posted to the home page of every group member. Send a weekly message that adds value for group members and drives traffic back to your site. Connect people in the group by making introductions to those who could potentially do business with one another. All of these points will help you generate more leads for your business. If your sales funnel is set up correctly, you will have more than enough prospects to grow your business. One question I’ve asked was, “How often are you answering questions for others on LinkedIn?” I received about 20 responses, but one answer stood out from the rest. I had an individual share that he spent about an hour a week answering questions and he was getting three to five new clients a month bringing in roughly $3,000 to $5,000 extra in monthly revenue. Not bad for answering a few questions, huh? 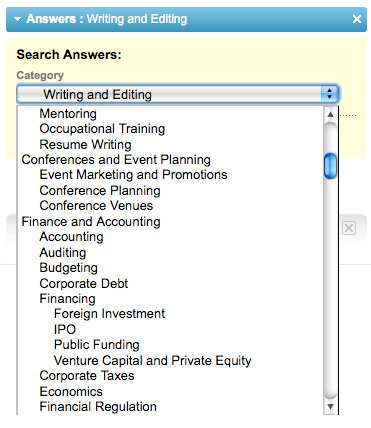 First, set up the “Answers Application” on the bottom right-hand side of your home page for the subjects you know best. This image shows a sampling of the categories you can monitor. Research the person who asked the question, and find a way to tie in a personal response with something from their LinkedIn profile. Be as helpful and resourceful as possible when answering the question. Give tips, website links with additional information, or even recommend someone who is the best expert on that topic. Leave the answer with an open invitation for more communication by asking them to contact you privately if they need any extra help. All of these tips will help you gain the most out of answering questions, and will help you build powerful relationships that will grow your business. I threw close to 20 events around the country last year and I used LinkedIn to promote them, getting approximately 500 paying attendees per event. This image shows what the events page looks like in LinkedIn. I noticed that we’re both connected to Mary, Jeff and Bob; we both played basketball back in college; and we’re both in Toastmasters International speaking club. I would love to connect with you to learn more about your experiences at Xyz Company. I believe there are a number of ways we could help one another. Would you be free for a brief chat in the near future? Are you using LinkedIn? How is it working for you? I look forward to hearing what success stories your LinkedIn network brings you. Share your comments below. Lewis Howes is the co-author of the LinkedIn success book, 'LinkedWorking: Generating Success on the World's Largest Professional Networking Website.' He also founded the Sports Executives Association and SportsNetworker.com events.